The trials and tribulations of learning WordPress theme development for the first time have a special place in my heart. As a person without a formal development background trying to do it for the first time, I remember how hard it was to grasp concepts just from reading the WordPress Codex or looking at existing theme code. On the flip side, I can still specifically remember each of the talks, tutorials, and one-on-one time with colleagues that resulted in “A-Ha!” moments, which drastically improved my understanding of WordPress theme development, almost like a light switch going off in my head. I know now that there are certain specific concepts (like the Loop, WP_Query, and the Template Hierarchy) that are crucial to understand before you can really start building and modifying custom themes. While it was great when I finally started to learn those things, those “A-Ha!” experiences were few and far between, and often depended on being in the right place at the right time. It would be great to find easy to understand tutorials about those things all in one place, as well as general good development practices which aren’t always mentioned in WordPress tutorials. The problem is that many resources out there often try to solve one single theme development problem, rather than provide a baseline for the entire process. Or, like in the Codex, they’re written with an assumption of higher level knowledge that I didn’t yet have, making them hard to understand as a beginning developer. If that’s the case, why don’t we just write these tutorials ourselves to address the problems we encountered as we were learning? Ideally, that’s what we would all do, but sometimes that blank page is difficult to get past. Whether it’s a lack of specific ideas, lack of organization, or lack of time, we all have plenty of reasons not to write. Dan Beil is hoping to solve both of those problems by putting together a series of tutorials and topics, with everything opened up for collaboration on GitHub. People can suggest ideas, contribute by editing for grammar or modifying the articles, or forking to create their own new content. When he publishes the content on his own blog, people who contributed will get author credit and links to their site. He’s hoping that it will encourage people who maybe don’t want to write a whole article on their own to contribute, or maybe inspire someone to write a new article based on a suggested idea they hadn’t thought of yet. I am helping him with his Building Your First Theme tutorial series, doing general content editing as well as supplementing his written instructional content with explanations of why certain concepts are being used, and how it all fits together as part of a bigger picture. I think this specific series is extremely important, and I want it to become a go-to resource for a person that wants to build their first theme from scratch, or learn what makes WordPress existing themes tick. Go check it out and let me know what you think! If you have ideas or suggestions, you can submit pull requests or issues to the project, or reach out to Dan directly. Perfect timing! 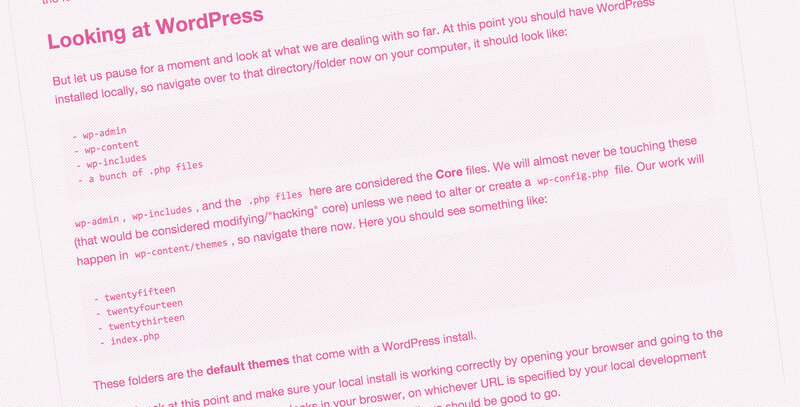 My goal this year is to learn theme development for WordPress. I’ll be first in line for all of his work products.